Leaders of the Trusted Partner Network (TPN) — an industry security initiative supported by roughly 30 media and entertainment companies, and created by the Motion Picture Association of America (MPAA) and the Content Delivery & Security Association (CDSA) — will be on hand Feb. 12 at the 2019 HPA Tech Retreat, to discuss how content owners and facilities can better mitigate the risks of a cyberattack. 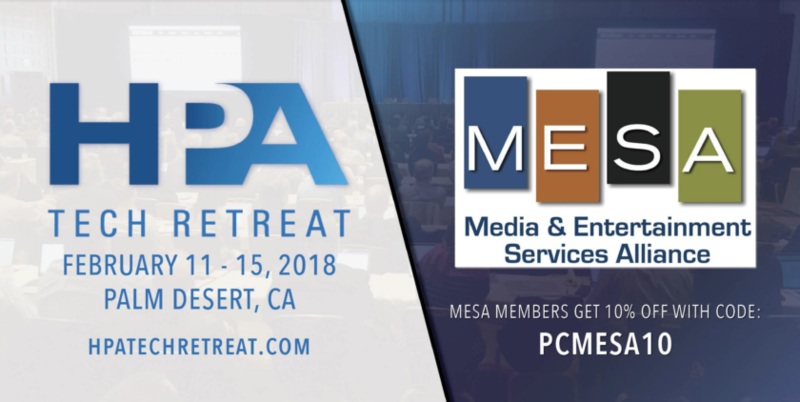 Members of the Media & Entertainment Services Alliance (MESA) can receive a 10% discount on 2019 HPA Tech Retreat registration, by using the code PCMESA10. Today’s sophisticated content productions have attracted next-gen security threats, causing significant damage to both content owners and productions facilities. Stanbury and Finley will share a case study of a sophisticated content hack and security breach, and use it as an example of how content owners and facilities can be better prepared to mitigate the risks of an attack. TPN was developed to meet threats with next-gen security solutions, representing an important industry effort to leverage technology, platform and community to transform a year’s old process into the next generation of production. The 2019 HPA Tech Retreat will see nearly 20 MESA members present and attend the retreat, including Adobe, Amazon Web Services, Avid Technology, Dolby, GrayMeta, G-Technology, Microsoft Azure, NAGRA, Pixelogic, Prime Focus Technologies, Salesforce, Signiant, Sohonet, Sony, Technicolor, Teradici, Video Gorillas and Western Digital. To register for the 2019 HPA Tech Retreat, click here.